In the early 1900s, health and education officials began to concern themselves with the health of children of low-income families living in the city’s crowded slums. 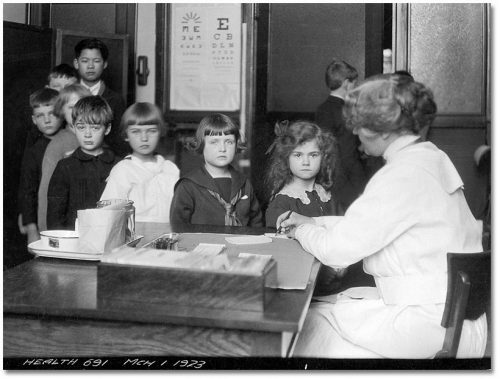 The Board of Education started giving students medical and dental examinations and treatment in 1910. 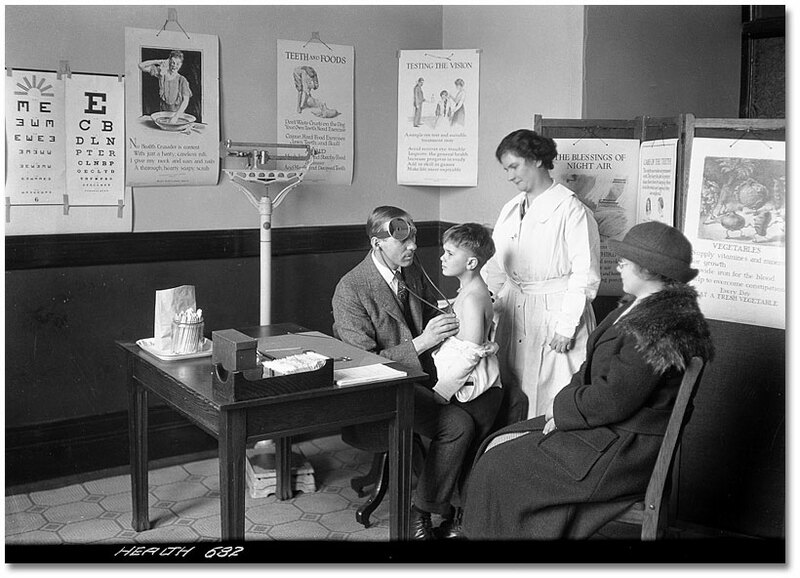 In 1917, the Department of Public Health took over this service. 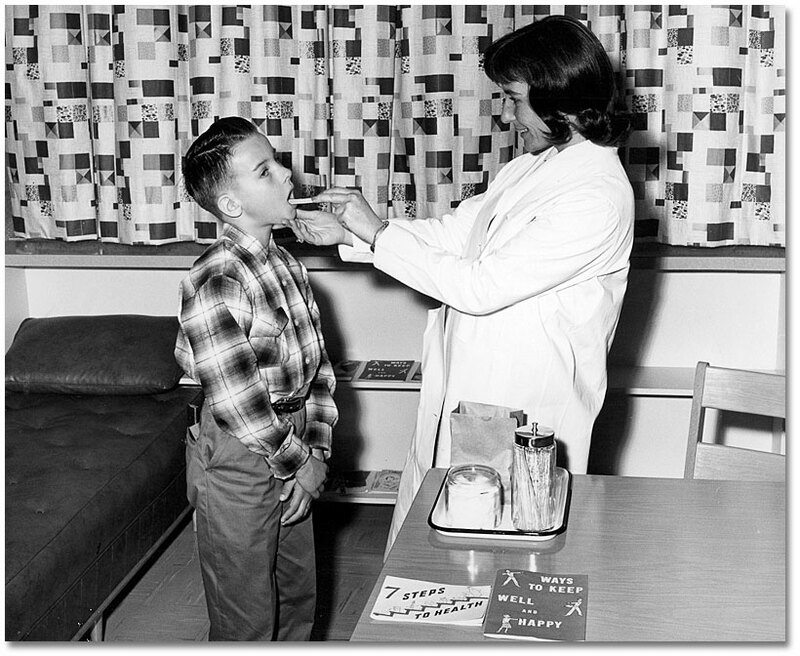 The school health program was expanded and still operates today. 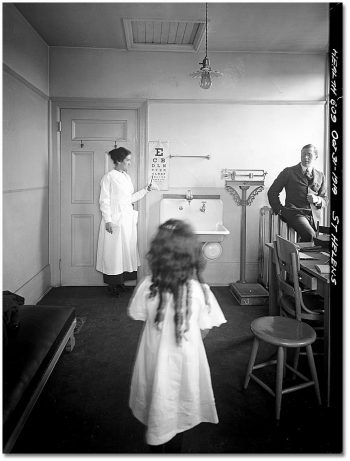 When the department began school dental services in 1910, a sampling of twenty schools revealed that 97% of children had “defective teeth,” with five to ten cavities being common. The “tooth brush drill” and other methods of teaching children how to look after their own teeth were introduced as critical components of the school health service. 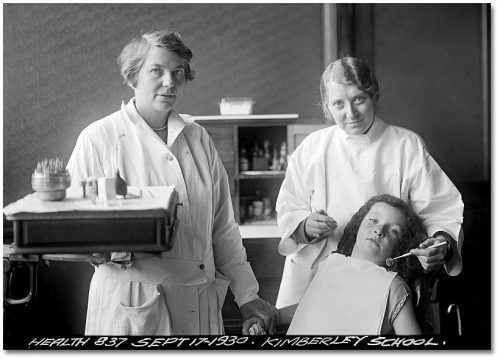 By 1925, the situation was much improved, with only 66% of students overall having dental defects, and even those students had fewer cavities than before. The aims of the school health program were to control communicable diseases, identify and correct health problems, and teach children how to look after their own health. The cornerstone of the program was a regular health examination of each student. The examinations included complete medical exams, dental checkups, and eye and hearing tests. Children who had been absent from school due to illness were examined by a public health doctor before they could return to the classroom. This process also informed the public health nurse assigned to the school that she should keep an eye on the child’s condition. Other examinations, such as psychiatric tests, could be arranged if a teacher or parent thought a child could benefit from them. For poor families, with little means to pay for the care of doctors and dentists, the examinations and subsequent treatment were of enormous benefit. Their children received free vaccinations to ward off disease, making it possible for them to reach adulthood. 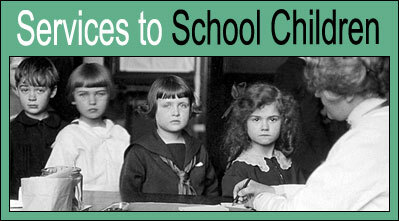 The department also worked with the Board of Education to accommodate children’s special health needs in the schools. One such attempt was the outdoor forest school, where vulnerable or undernourished children could be exposed to fresh air, receive hot meals, and an education at the same time. There were two forest schools, one in High Park and one in Victoria Park. The term ran from May to October, giving students almost as many hours as a regular school year. 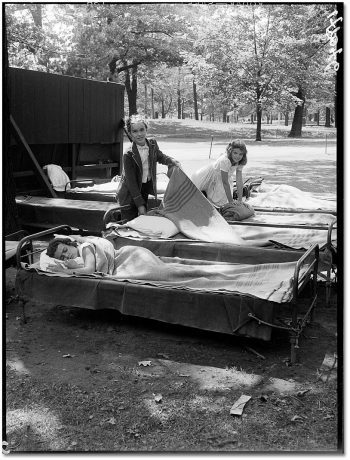 A daily nap was one of the benefits of being in a forest school. A hot lunch, two substantial snacks, plenty of fresh air and sunshine, doses of cod liver oil, and instruction in healthy habits were also part of the program. Most students gained weight and improved their health after one term in the forest school, and then they returned to the regular classroom. 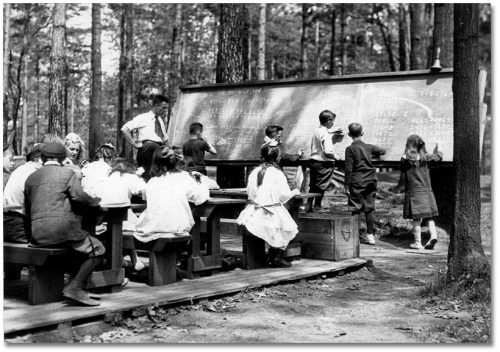 The forest schools were closed in 1963. The department was concerned that eye strain could cause vision problems, so “sight-saving” classes were introduced. 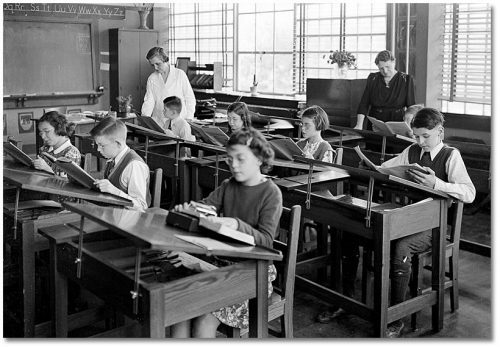 The classes featured glare-free blackboards, proper lighting, restricted lengths of reading time, and other measures. After it was discovered in the 1950s that nearsightedness was mostly hereditary, the students were prescribed glasses and returned to regular classes. 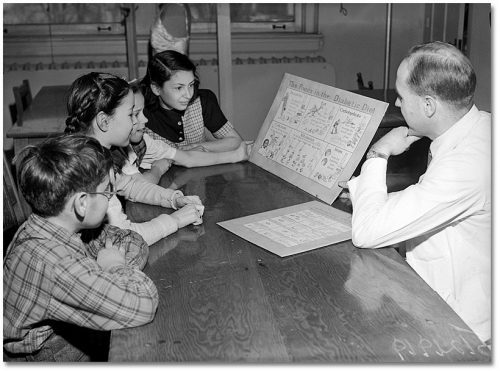 “Orthopedic” classes allowed children with physical disabilities to get educated while also receiving their medication, treatment, or physiotherapy. The children in the class below learned to manage their diabetes by eating a healthy diet, using insulin, and testing their own blood sugar. 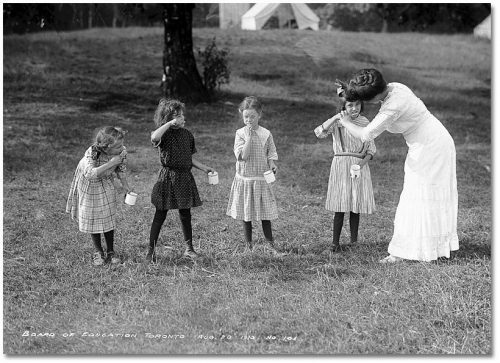 The class was taught by a doctor or nurse, quite likely provided by the Department of Public Health.